At present, the major concern of most people is their safety not only in regards to their personal safety, but of course for their home. Home is where you live together with your family, and this is the reason why you have should have the best possible types and choice of roof truss installed in your home. Raised Heel Roof Truss. Among with the different types, this one is the most efficient types of roof trusses to choose from. Most people choose this type, because of the reason that it brings a very perfect room design for insulation, and at the same time, it provides you with the very strong structural support in your home. However, to make sure that your home is well- structured, you need to have additional materials to make the best possible built results. In addition, this type of roof truss is expensive than any other types, but it does make sure that your home is well-structured when it comes to its roof. Scissor Roof Truss. In particular, this type is usually seen in cathedrals. With this type, there is no need for bearing or beams walls. However, like with any roof trusses, this one doesn’t leave that much larger space for its insulation, on the other hand, with this type you may expect for much space in your attic. Parallel Chord Roof Truss. For those who want to have an effective roof construction for their home, this one might be your best option which give you a little amount of budget for you to buy with. This one doesn’t require bearing or beam wall, instead you only need to use pieces of wood for using it in the construction of your home. Quadrangular Roof Trusses. You can actually see this type of roof trusses in a large construction spaces which include railway sheds or auditoriums. North Light Roof Truss. This type of roof truss is best suitable for larger spans go over from twenty meter and get up to thirty meter. In addition, it is one of those roof trusses which is most economical that you can find in the market. Fan Truss. This type is just only comes with simple design and that is made of steel. If you are looking for a type of roof truss within your budget, this one is your choice. 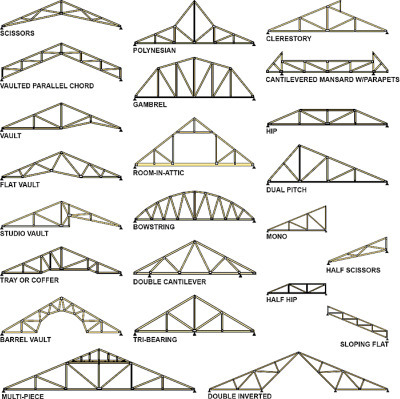 Howe Truss. This one is a combination of wood and steel, which for sure you can have to make your structural roof design more elegant and appealing. Pratt Truss. This type is the most popular steel roof in the market which is quite economical for you. If you are looking for a type that will give you a strong features for construction, this one is also the right choice for you. If you cannot decide which particular type of roof trusses you will choose, the above ideas can help you out.